Ivy Ready offers personalized college admission coaching by matching prospective applicants with former admission officers. We specialize in providing a personalized admission strategy for each student by capitalizing on their strengths, background, interest and aspirations. Coaching is available in-person, via Skype, by email and phone. Sign up for your introductory session! Our team is comprised of former admission officers with extensive experience supporting students with early college planning and admission consulting. Contact us if you are looking for a coach with a particular background and expertise. We are dedicated to finding the perfect coach for you. We offer Essays-only Support, Comprehensive Support (the most popular package), and Comprehensive Support with Logistics. All packages come with unlimited hours of essay editing and admission support. To request our fee structure, click here. 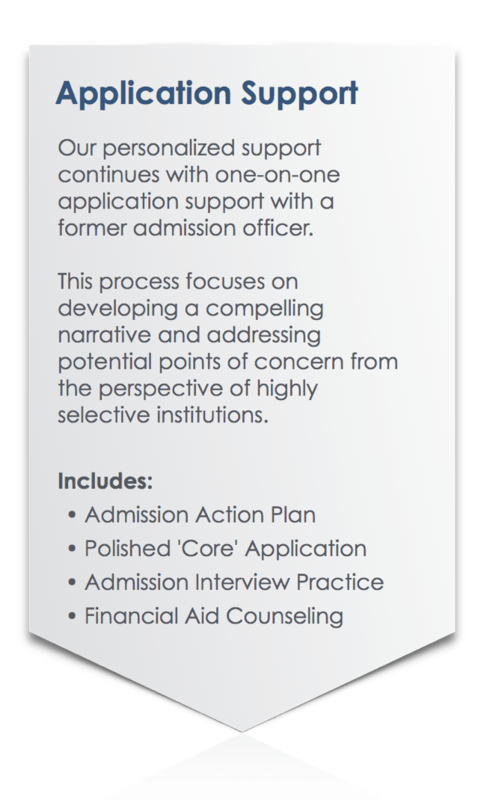 Our admission support begins by first matching prospective applicants with a coach who is best fit to work with them. Once the family has identified their coach, they can begin by creating a timeline for selecting colleges, writing essays, and document submission. 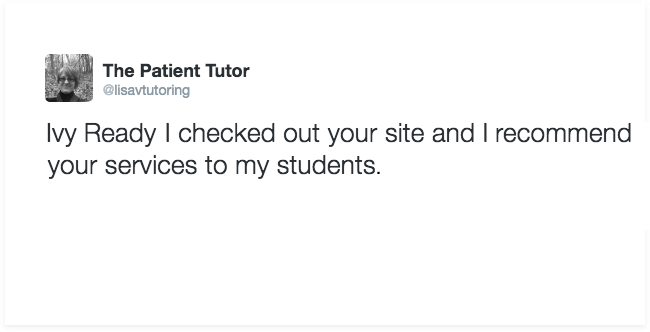 To ensure each student receives personalized support, we limit the number of students assigned to each coach. Ivy Ready coaches are fully dedicated to every applicant. Essays-only Support is available for applicants looking to self-manage the application process with guidance on essays. After initial discussion of prompts, students will move through a structured writing process, designed to help them create a compelling narrative that fits their unique background and interests. Comprehensive Support is the most popular package. In addition to support with essays, it offers expanded application coaching that includes brain storming for selecting teachers for letters of recommendation, school selection, application packaging, resume markup, and insights with other aspects of the application process. Comprehensive Support with Logistics is our most comprehensive support package. It gives families the option of offloading the logistical aspect of the application process to the consultant. This is an excellent option for applicants who have limited time and would prefer the coach takes on the logistical burden associated with applying to numerous schools. With this package, the coach will take the lead in all areas and handle logistics, allowing the applicant to focus exclusively on areas requiring creativity. For example, the consultant will compile application requirements, deadlines, essay prompts, links to submission portals, etc., to ensure applicants are able to submit their best work with ease. Furthermore, the coach will create a detailed timeline and send reminders. The consultant will be deeply involved with the logistical aspect of the application process, in addition to providing admission expertise. To request our fee structure or ask questions, click here. Support with the writing portion of the application process will consume a significant part of the support timeline. Please find below an estimate of the number of writing pieces required to apply to a set number of schools. Essays-only Support is an excellent option for applicants who have personalized admission support at their high school, but are looking for feedback on their essays. However, the college application process is no easy feat especially given the time commitment required from the applicants in one of the busiest year of high school. In addition, Essays-only Support puts the responsibility of determining the application angle, setting the narrative, understanding how different pieces of the application support each other, etc., on the applicant. This will invariably require an understanding of how all parts of the application, including the extracurricular activities list and family background, work together with essays to help the applicant stand out. Ensuring the applicant is able to submit not only their best work but also the most compelling application to each school will require extensive planning, preparation, and oversight—included as a part of Comprehensive Support and Comprehensive Support with Logistics. Comprehensive Support with Logistics is best for applicants looking for complete support from the planning stage through application submission. On the other hand, Comprehensive Support is the most common option and covers support outside of the Essays-only package. The writing portion of the application will be the most time-intensive component of this process. The bulk of our coaching will revolve around crafting and honing a compelling narrative and developing the voice of the applicant. This will require considerable work before and during the writing process. For example, ten schools will require submitting up to thirty supplemental essays. (On average, each school requires three supplemental essays in addition to the personal statement.) Each essay will need to go through at least 4-5 drafts. And since supplemental essays have a limited word count, this will require extensive planning and follow-through from early summer through submission. In addition, supplemental essays represent each school's unique evaluation criteria. Schools will be looking closely at these essays to further gauge the applicant's interest and commitment to their respective schools. Every supplemental essay, in addition to the personal statement, must be top notch. Ill prepared essays cannot be submitted, as inadequate essays will give the admission staff an easy justification for not considering the applicant further. If essays are too short or are not well written, the admission staff may believe that the applicant procrastinated, may not be a great fit for the school because key elements are missing, or is simply not committed to entry into their institution. If the applicant is able to manage the logistical aspects of this process, Essays-only Support and Comprehensive Support will be the right option. Otherwise, we recommend Comprehensive Support with Logistics in which we take the leading role in the whole process. Comprehensive Support with Logistics, as a more personalized option, will relieve the applicant of the responsibility and stress that accompanies the logistical aspect of the application process. The burden of this on the applicant cannot be underestimated, as our role in alleviating this stress through Comprehensive Support with Logistics cannot be overstated. By ensuring the applicant is on track from the start, we make sure there is enough time to refine every essay and submission. With Comprehensive Support with Logistics, we take charge of the process on our end by notifying the applicant of due dates for drafts, providing the support needed to ensure all documents are submitted on time, and by being there when anything comes up at the last minute, etc. When it comes to personal statements, while the same essay may be used as a template for multiple submission, we recommend writing an essay tailored to each school and program. In instances where admission is granted for a specific college, instead of the university as a whole, tailoring the personal statement to each school will be critical in demonstrating the applicant's interest and increasing their likelihood of admission. Especially at highly selective institutions, which based on the 2016 acceptance report is an ever-growing list of schools, every aspect of the applicant (not only what is in the application but also their background, school and family context) will be closely examined. Hence, whether the applicant wants to apply to one, five, ten, fifteen or twenty schools, every submission must be completed with the utmost attention to detail—one application at a time. Crafting every application in a manner that showcases the applicant in the best light will require considerable time, engagement and effort from both the applicant and the consultant. In other words, since every school's admission committee is making a decision on every applicant independently, each submission must be prepared in a same manner that ensures maximum potential for the best outcome. Please complete the form below or call 650-383-0352. How did you hear about Ivy Ready? We offer undergraduate and graduate school counseling and application support. Please contact us if you have questions or call us at 650-383-0351.